Complex Says: Long before the Circuit of the Americas attempted to bring the Formula One circus to the Lone Star state, Dallas represented just one of the two U.S. dates on the F1 calendar. The other was Detroit. Critics disliked how the Dallas track seemed to crack under the weight of both Texas heat and the Formula One grid. 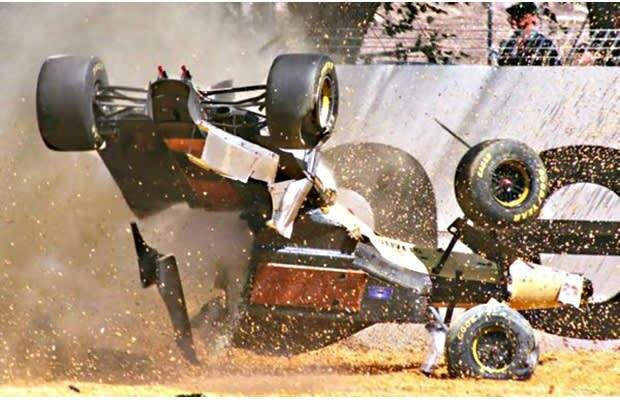 Badly placed concrete barriers at the track proved to be Martin Brundle's undoing as he bounced like a pinball between two of them during practice, breaking both front wheels off the car and landing completely upside down. It was Brundle's first year in F1, and to add to the frustration of the season, he broke both feet and ankles in the crash. At Detroit, he finished in his best position so far: third behind Nelson Piquet and Alain Prost. Unfortunately, he and the Tyrell team were disqualified after post-race inspection revealed some irregularities with a water tank used for the car's injection system. Ultimately, all race results for the team for that year were wiped out of the official records, as though they'd never existed. Brundle came back to the sport for 1985 and continued to race professionally until 1996, still occasionally feeling the pain of those early injuries.